Some time ago, under the title "The Sword of a Great Officer," I posted an image of the hilt of sword that had been presented to HBC Factor Roderick MacFarlane in 1857 by an elderly Inuk who told him that it was from one of Franklin's men, the "sword of a great officer." I noted that this sword was engraved with "W IV" for King William IV, and therefore dated to his reign (1830-1837). I'd tracked down the date at which each of Franklin's senior officers might have obtained their lieutenant's commission (the usual date on which one acquired a sword), and found Fitzjames the closest match -- though, in his case, a delay between getting his passing certificate and his commission meant that he wasn't promoted until a year after William's reign ended and Queen Victoria ascended to the throne. Ah well, I thought to myself, what's a year? To my lasting shame, I didn't take the time to look closely at the guard, which featured an open "basket" style rather than the closed gilt guard that had been standard in the Royal Navy since 1827 (and indeed, is standard still). Seeing one of these sorts of guards among the latest artifacts brought up from HMS "Erebus" pricked my memory -- and that of my colleague Glenn M. Stein as well. 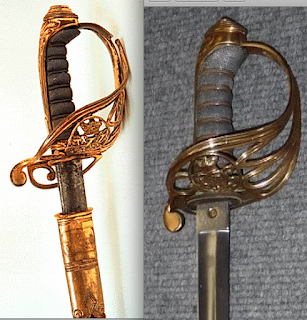 In response to a query by fellow Franklinite Regina Koellner -- mightn't a Sergeant of the Marines have had a sword as well? -- he passed along an image of the type of blade that would have been issued to a Sergeant in the Royal Marines (right, above) -- and lo, there was the open style of guard, almost exactly as seen on the hilt given to MacFarlane! Which leads me to Solomon Tozer. Years ago, my good friend Dave Woodman proposed that perhaps Tozer, whose name may well have sounded to Inuit ears very similar to Crozier (rendered by Hall's informants as "Cro-zhar"), could have been the "great officer" of this Inuit story. I dismissed the idea, my head filled with romanticized notions of Fitzjames among the final survivors -- how could a mere Sergeant of the Marines, the hardest-working (and lowest-paid) of all the Expedition's members, be that man? But now, seeing the sword, I went at once to Ralph Lloyd-Jones's excellent article on the Marines who served with Franklin, and discovered that Solomon Tozer had enlisted in Bath on 12 November 1834, well within the reign of William IV! At the age of 18, Tozer was 5 feet 8 1/2 inches tall with light hair, hazel eyes, and a fair complexion. He was a carpenter by trade and, as befits one who reached the highest non-commissioned rank, had an extremely neat signature. A unique solecism recorded that he was ‘D[ischarged] D[ead] North Pole [sic] expedition under Sir John Franklin’ (ADM 158/69). He appears as a fairly major, brave, and practical character in Robert Edric’s novel The Broken Lands (Edric 1992). Interesting thoughts as always. With all I've read (and retained only fractions of that sadly) I never thought of Crozier possibly being Tozer, especially when allowances are given for the language barriers of all those involved. Like many, I had it fixed in my mind that Crozier and Fitzjames would have been among the last of the survivors. But the identity any leader of those who led survivors as they marched on might have been misidentified by the Inuit and that original error compounded by the vagaries of language of the subsequent searchers. Looking forward to getting details on all new artifacts brought up in the latest dives. I admire the patience and professionalism of those involved as it must be so tempting to just "treasure hunt" at such a location! Interesting read indeed. Who else may have carried a sword like this? Could other marines have brought swords along too? Maybe the "great officer" was not someone with a storied background or past, but rather an individual who, in the eyes of the Inuit, fulfilled a significant leadership role among a small group of survivors in a battle of survival. If an officer of the Royal Navy would not carry a sword like this one and the sword belonged to the individual who carried it, maybe we are indeed looking at a marine. If so, what would we expect from a group led by a marine? An escape south seems more likely than a trek to the cache at Fury Beach.